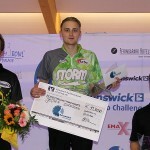 In an all-Swedish title match, reigning PBA Rookie of the Year Jesper Svensson of Sweden defeated his fellow national team member and fellow PBA touring pro, Martin Larsen, 228-222, to capture the title in the 2016 Brunswick Euro Challenge Sunday at Dream-Bowl Palace in Munich, Germany. 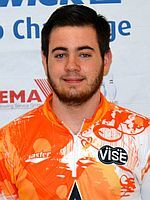 It marks the sixth victory on the European Bowling Tour for the 21-year-old World Youth champion (pictured above) and also his fourth Professional Bowlers Association title after winning the PBA Tournament of Champions earlier this year for his first major title. Larsen (left), an 8-time EBT champion who was trying to win his first PBA title, started the title match with four consecutive strikes to take a 28-pin lead as Svensson was unable to strike on the left lane (7) alternating strikes and spares. 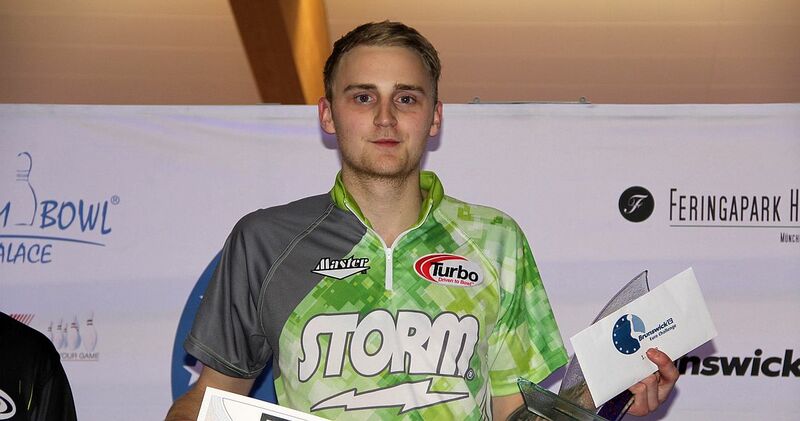 Larsen’s lead melted to 17 pins after Svensson doubled in the fifth and sixth frame and he followed the four-bagger with four consecutive spares. A pocket 7-10 split in the 9th frame by Larsen opened the door for Svensson, who finished the match first. Needing a double and a seven-count to shut out Larsen, the two-handed lefty delivered two strikes and a 9-count to seal the victory. Svensson pocketed 11.300 Euro along with the title, while Larsen received 8.500 Euro for second place. In the opening match of an all-Swedish stepladder final, Larsen flew past his namesake Jesper Larsen (left), 245-175, for the right to bowl tournament leader Svensson for the title. Martin came out of the gates commandingly by connecting for the first four strikes and never looked back. Jesper, a two-hander who delivers the ball from the right-hand side, fell behind early in the match due to three opens in the first six frames. Martin suffered two open frames in the fifth and sixth before he went off the sheet with a six-bagger for an easy win. The tournament was highlighted by 10 perfect 300 games. 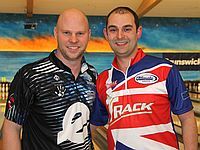 Dom Barrett (right) of England won the 300-game jackpot and 3.150 Euro in a shootout in “low-man-out” format with his second strike against Tommy Jones (left), United States. 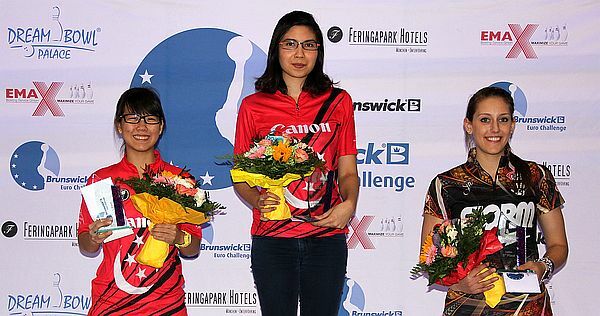 The 13th Brunswick Euro Challenge drew 311 players from 34, 245 men and 66 women. 64 players survived the qualifying with the top 12 advancing to the second round. The other 52 players bowled the first of two six-game rounds to cut to the top 16. 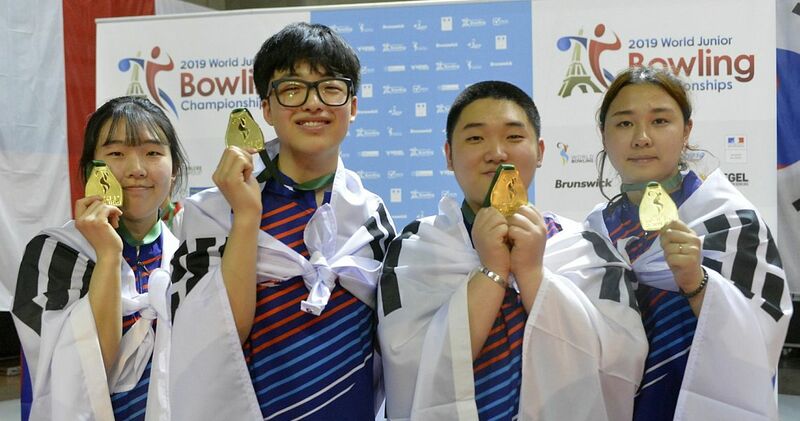 Two-time PBA champion Anthony Simonsen (left), United States, who won the USBC Masters in February to become the youngest player to win a major title on the Professional Bowlers Association Tour at 19 years and 39 days averaged 248.17 to lead the first round with 1489. Jones, a 16-time PBA champion, took the last spot to advance with 1388 and an average of 231.33. South Africa’s Francois Louw (right) rolled the 10th 300 game of the tournament yet failed to advance. Germany’s Tina Hulsch was the lone of 10 women in this round who made the second cut. After another six-game block, the field was trimmed to eight players for seven games of match play. 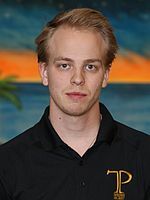 Martin Larsen paced the second round and carried forward 1498 pins into match play. Five men and three women advanced. Jones again took the last spot to advance with 1404 (234.00). Third-place Jesper Larsen missed the 11th perfecto by one pin. In match play, players received 30 pin bonus for a win and 15 for a tie. The two Jespers battled it out for the No. 1 seed in the last match. Trailing Svensson by just 32 pins, Larsen needed a double in the 10th frame to overtake his opponent. When the dust had settled, Svensson won the game, 232-207, as Larsen left a washout and failed to convert the constellation. 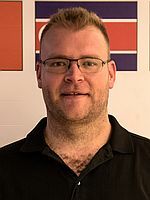 Martin Larsen defeated 17-time European Bowling Tour titlist Paul Moor of England, 247-213, to secure third place, mere eight pins behind his namesake. 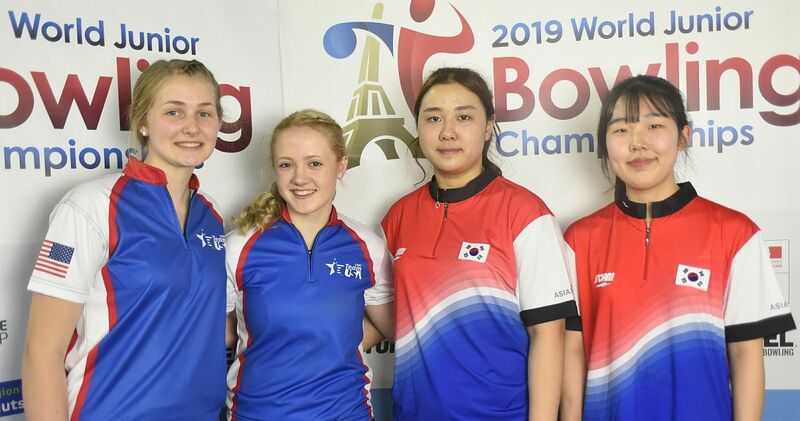 Fourth place Danielle McEwan won the World Bowling Tour women’s ranking for the third time in as many events this season after winning the season opening H.H. Emir Cup in Qatar and an 8th place finish in the 14th Kingdom of Bahrain International Bowling Championship. The top three women in qualifying were awarded bonuses. 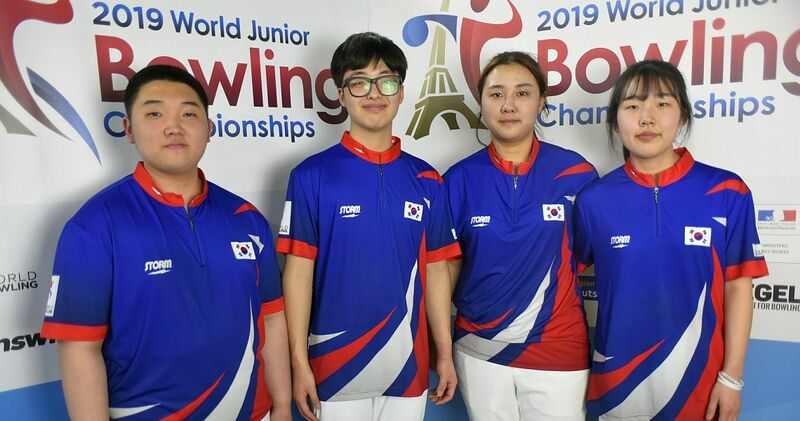 Jasmine Yeong Nathan (center) of Singapore led all 311 bowlers with 1539, including handicap, and an average of 248.50 to win 1.200 Euro. Her fellow countrywoman Joey Yeo (left; 1475) was fourth Danielle McEwan (right; 1468) was seventh to receive 700 and 500 Euro bonuses for being the second and third best woman, respectively. 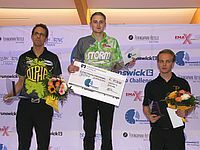 The 13th Brunswick Euro Challenge was the fifth stop on the 2016 European Bowling Tour and the second of three EBT “Platinum” events this season, the highest of the four EBT tournament categories. 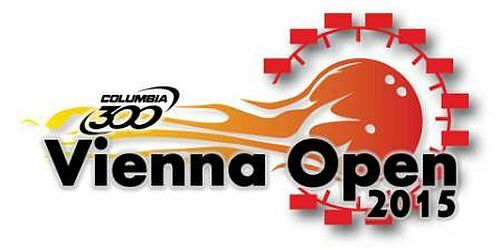 The BEC was held from March 13-20 at Europe’s premier bowling center, Dream-Bowl Palace, a 52-laner in Unterföhring in suburban Munich, Germany. Players competed for total prize fund of 103.000 Euro. Women receive eight pins handicap each game, an equality handicap provided to women in all EBT events. The top three women after qualifying received 1.200, 700 and 500 Euro bonuses, respectively. 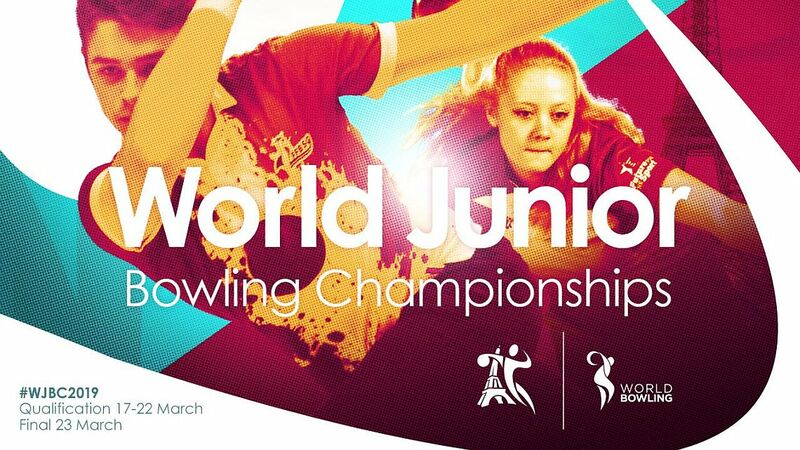 The BEC was also the third event of the 2016 World Bowling Tour. Due to an agreement between World Bowling and the Professional Bowlers Association (PBA), World Bowling Tour tournaments will award a PBA title to the winner if he/she is a PBA member and bowls without accepting handicap pins. Qualifying kicked off Sunday, March 13, and ran through Saturday, March 19. Total 64 players qualified for the finals on Sunday, March 20, including the top 50 in the standings, the top 5 from a separate leaderboard of the squads conducted March 15-16, the top 5 from a separate leaderboard of the squads conducted March 13-14, and the top 4 of the Desperado Squad. The top 12 qualifiers received a first-round bye. 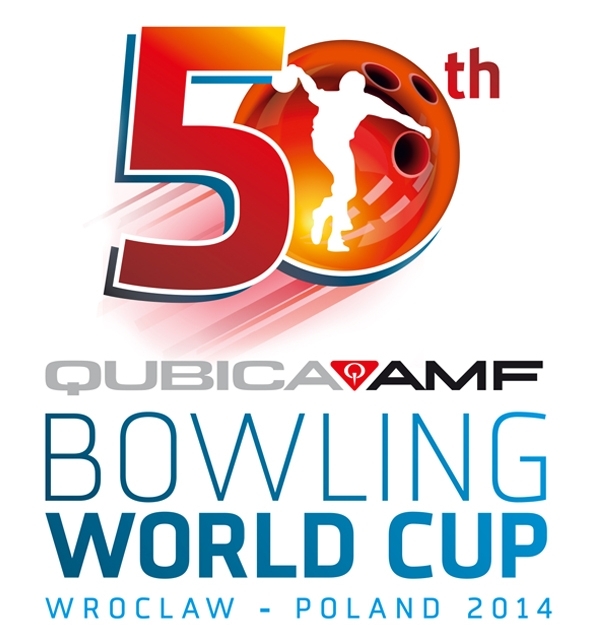 The other 52 players bowled six games scratch to cut to the top 16 who joined the top 12 qualifiers in Round Two. Those 28 bowled another six games scratch after which the field was trimmed to the top 8 for match play. Round Two pinfall was carried forward. The top 3 players after seven games round robin match play including bonus pins (30 for a win; 15 for a tie) determined the champion in a stepladder final. The No. 3 seed bowled the No. 2 seed and the winner of the semifinal match took on the No. 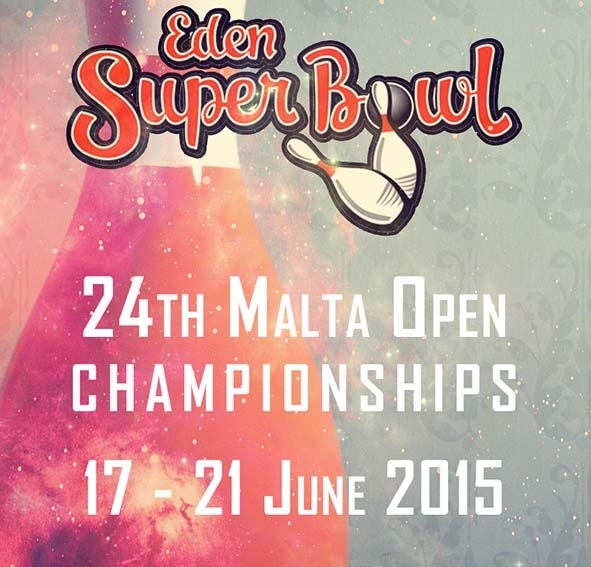 1 seed for the title and the 11.300 Euro top prize. 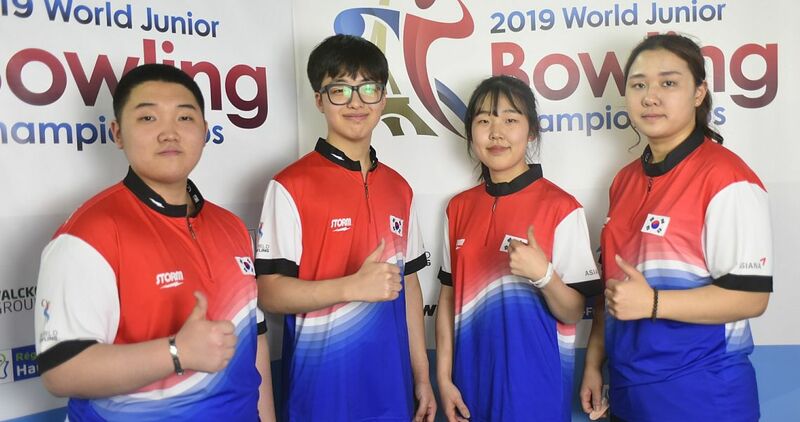 After the conclusion of the Brunswick Euro Challenge, the World Bowling Tour will take a five-month break returning to competition with the World Bowling Tour Thailand event, which will be held from August 6-12 at Blu-O Paragon bowling center in Bangkok. Semifinal Match: No. 3 M. Larsen def. No. 2 J. Larsen, 245-175. Championship: No. 1 Svensson def. M. Larsen, 228-222. 30 pins bonus per win, 15 for a tie. Top 3 advance to the stepladder finals. Top 8 advance to the round robin match play. Pins carry over. 300 games (1) – Francois Louw.